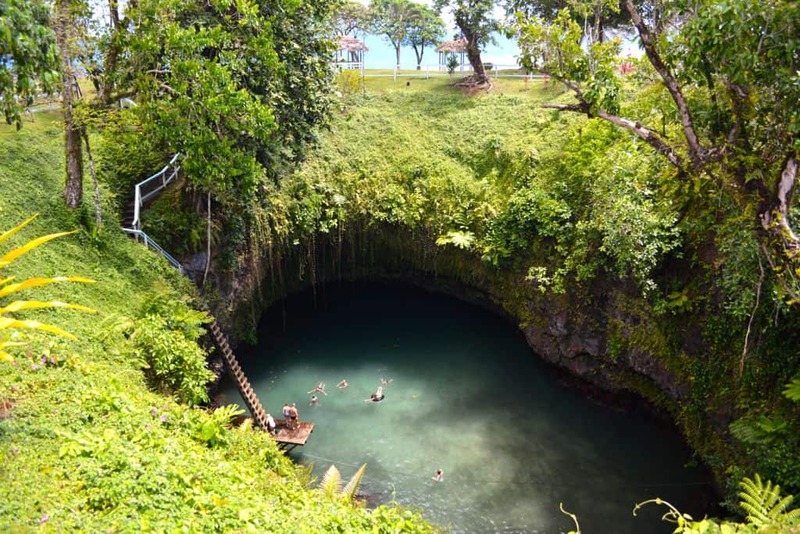 To Sua Ocean Trench is one of the must-do experiences while in Samoa. In this post we explain everything you need to know before visiting. It may sound a little bit silly but as a matter of fact there was just one reason for me to drag my family to Samoa for our yearly summer vacation: To Sua. A colleague at work had been there before and had shared fantastic photos of this freak of nature. I was getting really itchy looking at it, so beautiful and fascinating, and truly unique, I had to see it with my own eyes. So when we travelled to Samoa, To Sua was definitely on the list of things to do around the island. So what exactly is To Sua? To Sua is a “big hole” (this is the actual Samoan translation) near the ocean that was created many many years ago through volcanic activity. The hole is around 30m deep and it’s filled with sea water that is directly connected underground with the nearby ocean. You can access the water by a steep ladder, and there is a suspended rope and a platform to ensure that swimmers can conveniently enjoy the wonderful scenery by hanging onto the rope. Swimmers enjoying the deep blue waters of To Sua. You can access the hole via a steep ladder. Once inside, there is a rope that will help you to stay afloat. To Sua is located on the south coast of Upolu Island near Lotofaga village. The hole is actually located in a park-like setting, and you need to pay a small fee to enter the area. In return, you can swim in the hole, enjoy the beautiful tropical gardens, go swimming on a small beach, have the kids discover the shallow lava formed pools and walk the lava fields. Plus, there are some fantastic views up and down the coast, so there are plenty of photo opportunities. To Sua is well maintained with beautiful little picnic fales that provide protection and shade, as well as toilet facilities, and benches; ideal to spend a whole afternoon here. Local kids watching the swimmers in the sinkhole. To Sua is accessible after paying a small fee. There are picnic facilities and other natural wonders nearby. Climbing down the ladder is a bit of an adventure, considering you are far away from any medical services somewhere in a not very accessible area. However, the ladder is definitely very sturdy and the steps have rough surfaces so that you don’t risk slipping. Unfortunately, when I visited it was low tide and the water was cloudy, so snorkelling was not very good. But still it was an amazing experience to swim in the water, surrounded by the tall black walls that are covered in green tropical foliage. The water would push and retract with the tide, so at any given time you would be gently pushed and pulled one way or the other. Just hold onto the rope that stretches across the full length and you can just relax, or swim around and discover the nooks and crannies of the hole. Swimming in To Sua is great fun. The tide will sway you gently from here to there. Snorkelling was less of an experience as the water was pretty cloudy. But there is more: If the hole is too daring for the kids, take them to the nearby lava pools instead. These are just a couple of metres away and right by the sea. The shallow water is even warmer than the water in the hole, and there are some great natural things to explore. However, be mindful that the lava surfaces are sharp, so kids should wear some kind of protective footwear such as plastic sandals or reef shoes. The lava fields have formed some natural ponds which are great for smaller kids. It is essential that you bring along rubber shoes for the little ones as the rocks are pretty sharp. The lava fields stretch to the east from here, a wide area of flat surfaces, ponds, streams, caves and underwater channels. The landscape is surreal with its black grounds, the lush green backdrop and the clear blue water of the ocean. There are many opportunities to test your courage – places you can jump in when the tide is just right, to dive under a lava bridge and come up again in a hole on the other side. There are blowholes that you can stand on to be sprayed by the salty water when the big wave comes. The water around us in the lava fields is teeming with life. There are shallow areas that rarely catch the tide, and you can see how fish chase each other in murderous pursuit, dashing out of the water and in again. There are crabs everywhere, alive ones, and those that have been smashed against the rocks by freak waves. We are salty from the spray, hot from the sun, and loving it. What a great way to experience nature. To Sua should definitely be on your itinerary should you consider Samoa as your next travel destination. If you have already been, let me know how you liked it! More photos below. To Sua is open daily from 7am to 6pm, adults pay around $7.50 AUD, kids $3.00 AUD (under 7s free). Some joker stuck a pipe into one of the smaller blowholes so that the water would be blown up in a big spray. If you suffer from vertigo than this steep ladder may not be for you. You have to hold on so as not to slip. To Sua is located in a pretty tropical garden. The gardens in general are beautiful in Samoa, and each dwelling seems to be surrounded by a Garden Eden. A wild pineapple was growing right next to where the children were swimming in the lava fields. One of the picnic fales. You cannot beat this view! Views of the coast from near the sinkhole. A burial site, presumable that of a local chieftain. The lava fields are teeming with fish and crabs. It’s great fun to watch them chase each other in the shallow ponds. A typical view of the area around the sinkhole. Some people in our group dared to jump into this inlet but the jump needed to be timed well. Quite the adventure! A crab on the lava rocks. We saw plenty of dead ones too. They were smashed against the rocks by the pounding waves. Samoa is a wonderful place for nature lovers. One of the many butterflies in the garden.